I don’t know about your house – but at mine, these are almost an *essential item*! 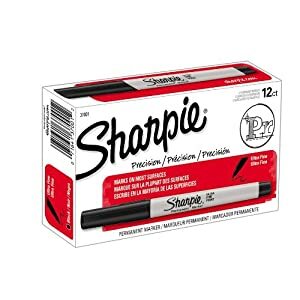 Check out this *HOT DEAL* on Amazon for a Box of 12 Sharpie Ultra Fine Point Black Permanent Markers for only $7.89! This would also be a great “back to school” gift for a teacher! As a former teacher, I know I personally went through these markers like crazy! Not a bad price to buy a couple of boxes!! The price listed above was as of 10:03am CST on June 27th, 2012. Prices and availability subject to change. Make sure you confirm the purchase price prior to purchase. « Facebook Contest: Win A Year’s Supply of Garnier BB Cream! I noticed that the red and blue fine tipped Sharpies are even less…. $5.90 for a box of 12. Not bad….